For most post-conflict countries, the transition to peace is daunting. In countries with high-value natural resources – including oil, gas, diamonds, other minerals, and timber –the stakes are unusually high and peacebuilding is especially challenging. Resource-rich post-conflict countries face both unique problems and opportunities. They enter peacebuilding with an advantage that distinguishes them from other war-torn societies: access to natural resources that can yield substantial revenues for alleviating poverty, compensating victims, creating jobs, and rebuilding the country and the economy. Evidence shows, however, that this opportunity is often wasted. Resource-rich countries do not have a better record in sustaining peace. In fact, resource-related conflicts are more likely to relapse. 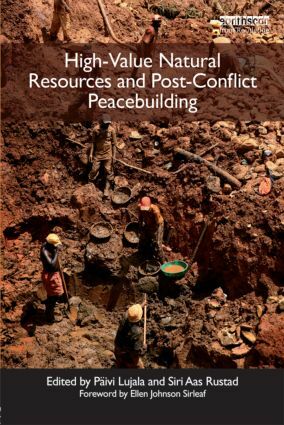 Focusing on the relationship between high-value natural resources and peacebuilding in post-conflict settings, this book identifies opportunities and strategies for converting resource revenues to a peaceful future. Its thirty chapters draw on the experiences of forty-one researchers and practitioners – as well as the broader literature – and cover a range of key issues, including resource extraction, revenue sharing and allocation, and institution building. The book provides a concise theoretical and practical framework that policy makers, researchers, practitioners, and students can use to understand and address the complex interplay between the management of high-value resources and peace. High-Value Natural Resources and Post-Conflict Peacebuilding is part of a global initiative led by the Environmental Law Institute (ELI), the United Nations Environment Programme (UNEP), the University of Tokyo, and McGill University to identify and analyze lessons in natural resource management and post-conflict peacebuilding. The project has generated six edited books of case studies and analyses, with contributions from practitioners, policy makers, and researchers. Other books in the series address land; water; livelihoods; assessing and restoring natural resources; and governance. High-value natural resources: A blessing or a curse for peace? Bankrupting peace spoilers: Can peacekeepers curtail belligerents’ access to resource revenues? The Kimberley Process Certification Scheme: A model negotiation?